Black and Silver/Stainless Steel in stock. ** BEWARE ** - there are lots of counterfiet products offered at half the price. 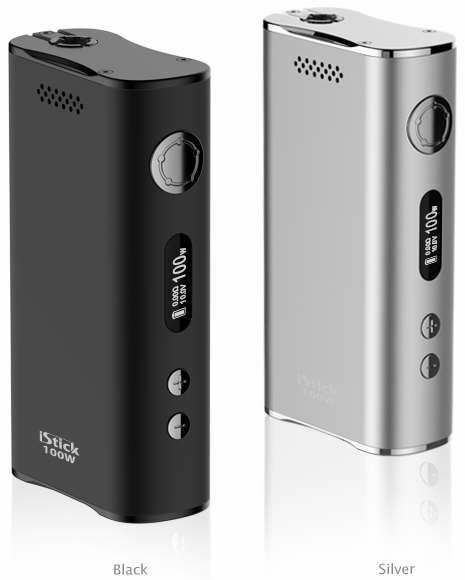 iStick 100W Box Mod is a new addition to the iStick series. The 100 watts maximum output will give you a powerful vaping experience. Designed with changeable 18650 cell structure, it will be more convenient for users who like to carry spare cells. The ventilation holes are specially added for better heat dissipation. With a round and smooth surface, our iStick 100W will also give you a great feel in your hand.Moreover, all stainless steel threads and elastic spring connector endow it with strong wear resistance. With temperature control function, less power and e-liquid consumption will also be a plus. Now with more power, the iStick 100W Box Mod comes with the simplicity we've all come to know and love but also introduces a couple new features here and there. Batteries are now user replaceable using two 18650 high amp batteries, you will never have to wait and charge your unit. Just pop in a fresh married pair and you're all set. Now double the power of their famous iStick 50W, the iStick 100W will provide sufficient power for you sub ohm vapers out there. With a round and smooth surface, the iStick 100W will provide an ergonomic feel and a comfortable vaping experience. Powerful vapor can be generated due to the expanded range of output voltage (2V-10V) / wattage(5W-100W). The iStick 100W features the ability to fire atomizers as low as 0.15 ohm which is perfect for blowing giant clouds and great flavor. It retains the strong spring loaded 510 contact pin and wear-resistant stainless steel threads. *The iStick 100W Box Mod requires (2) high amp 18650 batteries to power this incredible device which can be easily accessed using a powerful dual magnetized battery cover.